Our goal: respond to your specific needs with expert technical support, ready-to-use solutions, and dedicated new equipment training. At Rexel, we believe that partnering with you means saving your time and boosting your productivity by making every working day easier. 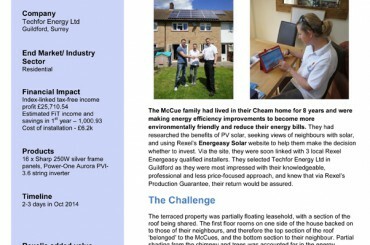 In Cheam, Surrey, the McCue family used the Rexel Energeasy Solar platform to improve the home’s energy efficiency and reduce their energy bill. Thierry Marquis, electrician, called upon Rexel to install solar panels on the roof of a home. Rexel goes beyond supplying the equipment, offering a full-service package of advice and training before work starts and technical assistance throughout the project.